Members of the Super Awesome Art Squad (L-R) Daniel Stratis, Calvin Lac, Erin Marquez, Ashley Huang, and Reid Tabata. They’re planning a new exhibit on the theme of High School. Find them and their work at Aupuni Place. 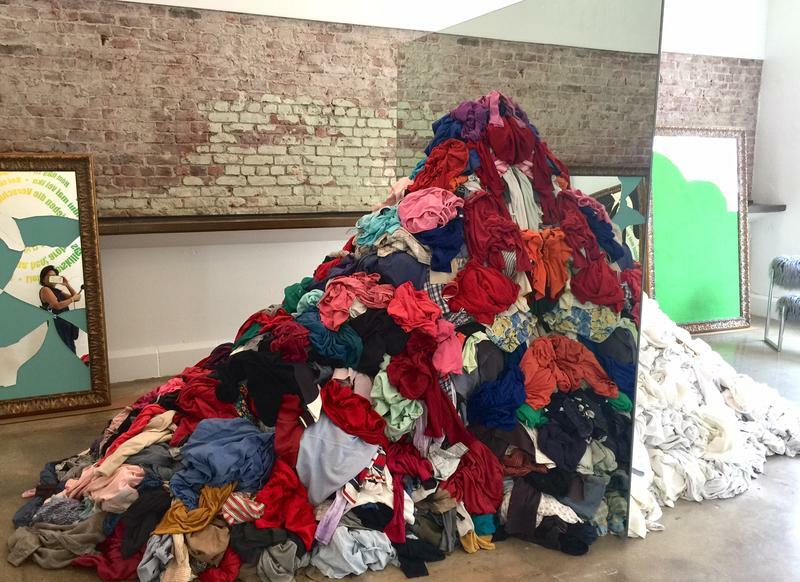 Painter Nanea Lum, a recent BFA graduate, is enjoying her first post-college studio space. She supports it by working at Moku’s at night, having the daylight to spend with her work. 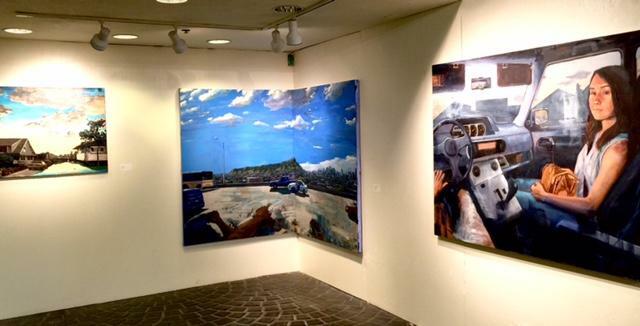 The painting on the right was seen recently in the Contact 2017 show. 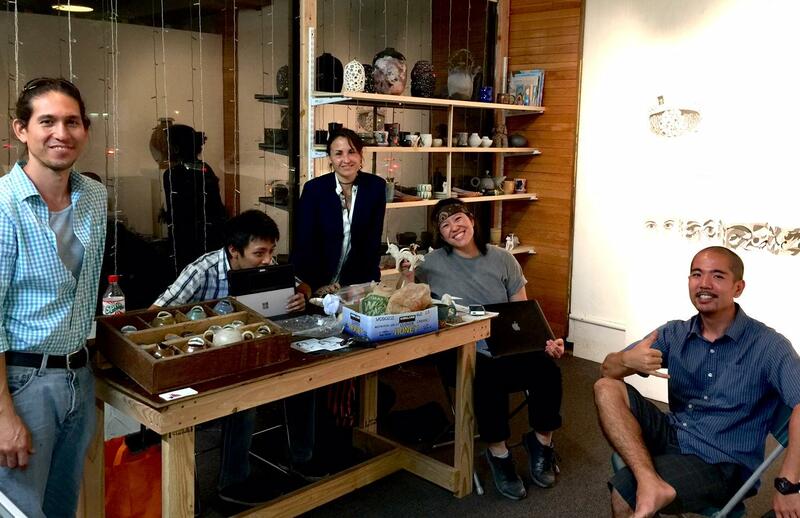 A look inside the new creative space, Aupuni Lane, Ewa side of Ward Warehouse. There’s always something going on at Aupuni Place, at the ‘Ewa end of Ward Warehouse. It’s open every day, 10 to 9 pm, Sundays until 6, with fine arts and crafts for sale, open studios, and more. 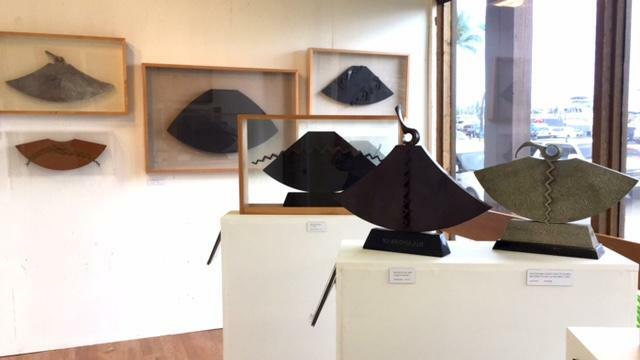 Urbanity Honolulu is the current show in the Aupuni Place Gallery through June 4, 2017. Featuring work by Tommy Hite, Andrew Yamauchi, and Shingo Yamazaki, the show explores experience and perception in urban Honolulu. (L) Shingo Yamazaki. Fragment. Oil on canvas. (C) Andrew Yamauchi. Thailand Express. Oil on canvas. (L) Andrew Yamauchi. Spiritual Resting Grounds. Oil on Canvas. People are really excited about things going on at Aupuni Place, where Na Mea Hawai‘i used to be, at the ‘Ewa end of Ward Warehouse. I figured I’d find Maile Meyer here, founder of Na Mea and this new project here, Aupuni Place. Meyer: You know what, it’s community space. Last night we had a standup comedian, Misty Kelai from Da Kine, she was absolutely hilarious. We’re doing Whatevah Wednesdays. It’s comedy, standup, improve, sing along, share your story, it’s the opportunity for community to gather without a cost. Its Wednesdays, 6-7:30, it’s sit out the traffic and do something fun. The former Na Mea Hawai‘i/Native Books space has been divvied into eight private studios, a gallery and community space with language classes, lā‘au lapa‘au classes, shell lei making, fishnet making. Artist, author Irving Jenkins has one of the studio spaces at Aupuni Place. Meyer is talking about the Super Awesome Art Squad, a loose hui of some of the best ceramists in Honolulu. They’ve taken a studio space and are producing like crazy. Their studio is open Tuesday, Friday, noon to 7 pm, Saturday, noon to 5 pm, Wednesday and Thursday, 5-7 pm, and Sunday, 2--5 pm. Hanafuda is going to have a renaissance if any of these ladies have their way. 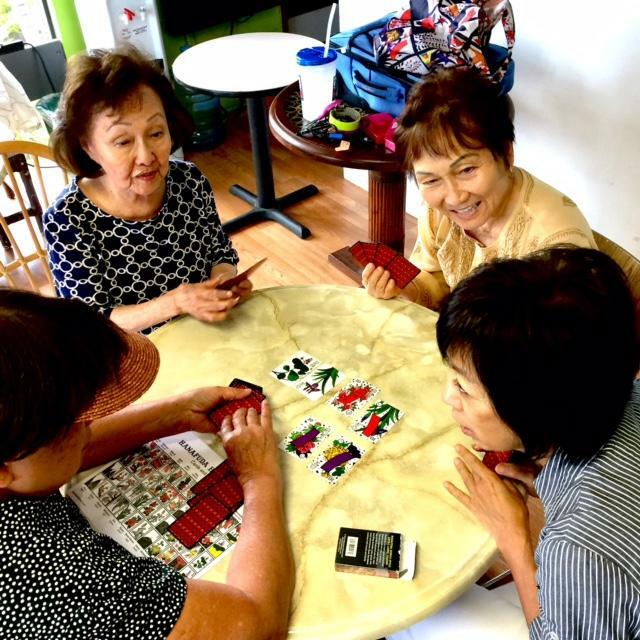 This hanfuda group, led by Helen Nakano, author of a recent Hanafuda guide, meets every Thursday, 1-3pm through July 2017 at Aupuni Place. Meyer: We have professional studio spaces for people like Nanea, and Meala, we have Andrew Yamauchi, Summit does podcasts out of the front, Eric Morgan has is door open, look in here. And you hear in the background, our hanafuda group, Helen Nakano and her gang. I strolled over to the players, intent on their tiny, colorful cards. Do you folks have money on this? The ladies: Pride. It’s a family thing. If we had money, there’d be knives coming out. Can I take a picture of you guys? Ladies: No names, no ages. They meet every Thursday, for anyone to come and learn or practice and play. For free of course. To join them, check Hanafuda Hawaii. 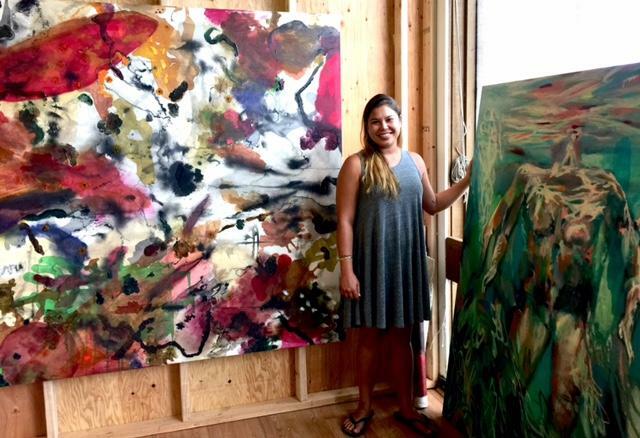 Painter Nanea Lum is rocking one of the studio spaces. Lum: Yeah, I’m 100% committed to making painting be my full time job. This is the first place I’m financing myself. That’s quite a commitment on your part, what is it doing for you? Out of a storefront closer to the center of Ward Warehouse, the Native Knowledge Center carries books and media related to Hawai'i. Lum: It’s making my projects more serious, and an extension of my practice for other people to come and see even when I’m not physically here. Creative consultant Marissa Abadir is assisting with programming. Abadir: It’s about activation. Activation of the now. Showing up. presence, and working, collaboratively, deeply, consciously and with awareness. Meyer: You’re going to love this. On Monday night we had our feather guys and I met a bunch of balloon twisters that were sitting outside. I said, you guys, you have to come, you can’t see anything, you look kinda sad out here. So they came in. They’re balloon twisters and magicians, so whenever they have their monthly group they’re going to meet here next to the feather guys. So the energy of just having people come in here and laugh. Find out what's coming on the Aupuni Place calendar. Maile Meyer, founder of Na Mea Hawaii/Native Books, has branched the original business into four storefronts in Ward Warehouse. 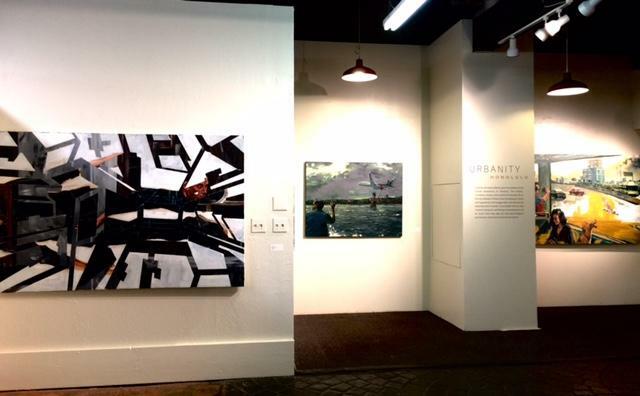 Urbanity Honolulu is the current show in the Aupuni Place Gallery through June 4, 2017. Featuring work by Tommy Hite, Andrew Yamauchi, and Shingo Yamazaki, the show explores experience and perception in urban Honolulu. Aupuni Place at the former Na Mea Hawai‘i now houses artist studios and workshops along with public class and event spaces. 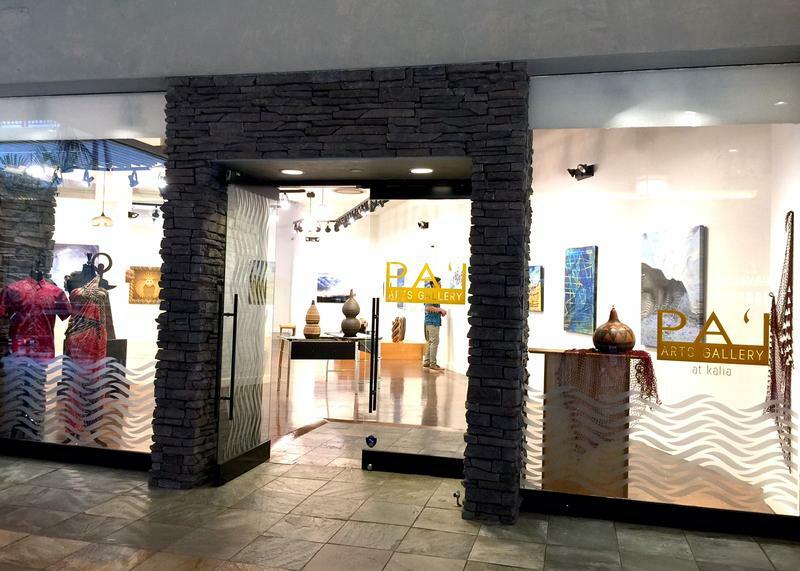 There are also art walls with original and reproduction art and sculpture from native Hawaiian and local artists.Events and classes at Na Mea and Aupuni are listed here. 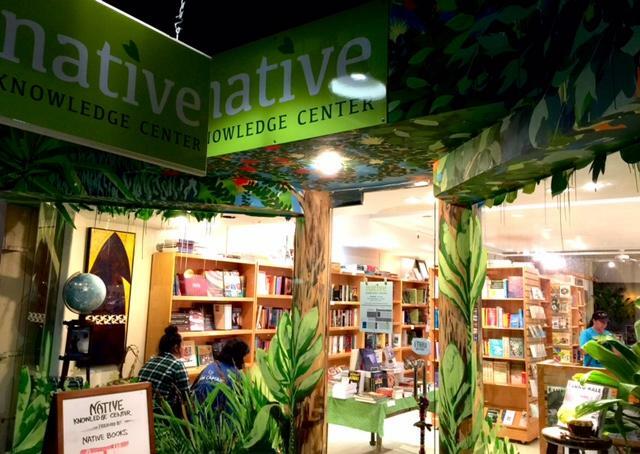 There's also the Native Knowledge Center , with native books and media. Hello Makana is a collection of local gifts and specialties. PARADISE COVE is a curated art gallery. Open Thursday through Saturday, Noon to 7pm and Sundays 1-5. Community Coloring Book, consists of two walls in the Food Court illustrated by artists Solomon Enos and Jasper Wong and colored in by the community. Nita Pilago’s Wahine Toa designs were a sell out, again, at the recent Merrie Monarch in Hilo. 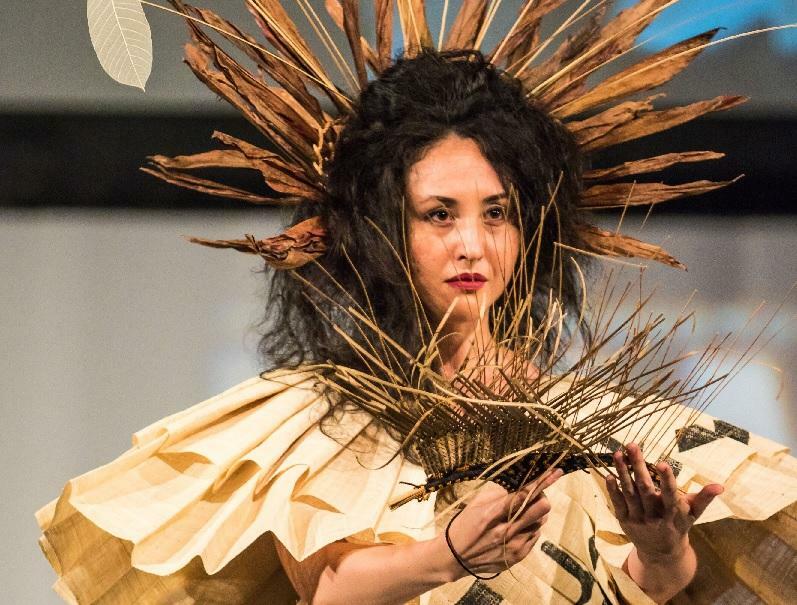 Just eight years in, her small Kona company is expanding production in Bali and Pilago has a new line of lava themed pieces planned for the upcoming MAMo Wearable Art Show. HPR’s Noe Tanigawa reports.